Do you post any content on the web? 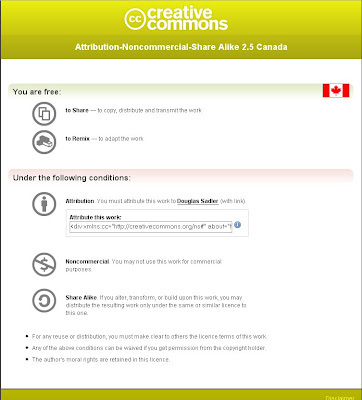 Use a Creative Commons license to protect your blog, wiki, video, photo, or podcast. The process is very easy and free. Join the web 2.0 revolution and publish some of your own content. Teachers have loads of content so why not share some of it! Choose your method on how to get your information on the web using a BLOG, WIKI, or PODCAST for example. 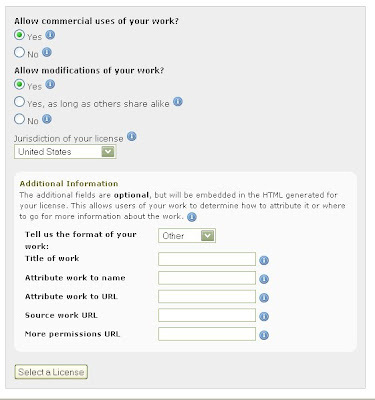 Once you have posted it on the web you can visit the creative commons website to get your free license stipulating how your materials may be used by others. The license for this blog can be found on the right panel. I believe people will be more apt to respect copyright once they have published their own work and went through the process to protect it. JOIN THE WEB AND PUBLISH! Hi Doug, do you have all the content of your blog and wiki copyrighted or do you have to do it for each individual thing. What about Power point presentations? If you share them in google docs(publish them I guess), do you licence each one? Free Is Good! Free Music is BEST!